Brendan Rodgers hailed Celtic’s Europa League win over RB Leipzig as his side’s best victory at home during his two-year reign as manager. “It was a fantastic victory and one that I’m very proud of,” said Rodgers. With RB Salzburg leading Group B by six points from Leipzig and Celtic after their 5-2 hammering of Rosenborg in Norway, it looks likely the German and Scottish club will be competing for second spot. Because Rodgers’ side did not match Leipzig’s 2-0 win over Celtic in Germany, Ralf Rangnick’s team remain second because of their head-to-head record. 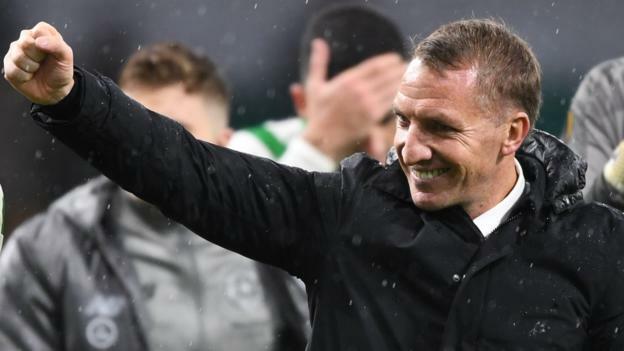 When asked if it was his best and most satisfying win in Europe at home as Celtic manager, he agreed considering “the level of the opponent” and quality of performance. “The players were absolutely brilliant,” he said. “And then the supporters were absolutely magnificent. Rodgers pointed out to his players before kick-off that “if it has gone against them a bit, sometimes the game has got away from us”. Kieran Tierney gave Celtic an early lead and, although Jean-Kevin Augustin equalised with 12 minutes remaining, Odsonne Edouard restored the lead within 14 seconds. “Tonight was a great step forward for these players because, at 1-1, when Leipzig didn’t deserve to be level in the game, they responded straight away and had that belief to play forward and get that fantastic winning goal,” Rodgers said. “This was a pressure game that we had to win, but you see the positivity of the team. Rodgers said it continued the recent improvement in performances from his side and was particularly pleased at the way they countered Leipzig’s playing style. “They were playing a system that can be very hard to press against – that midfield diamond,” he added.